This classic teapot is made from sturdy iron and has enamel coating on the interior to prevent rusting. It also comes with a removable stainless steel tea filter. 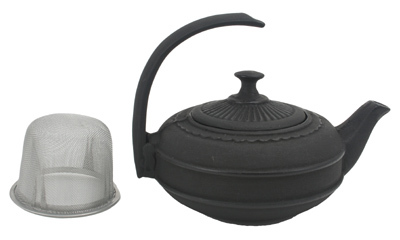 The teapot is glazed in black and cast with a traditional sun flower (Himawari) design. The sun flower symbolizes beauty and honor in Japanese culture. Cast ironware heats evenly and retains heat well and is praised worldwide for their beauty, strength, and superb quality. Please note that this teapot should not be used directly on stovetop to heat water. We love our new teapots, we do not have to temper them to keep the tea warm! The teapot is everything I wanted and more. The pot is heavy to heft and brews tea as you want and the brew ,keeps hot for the duration of the tea break. I received my teapot in a timely manner. It is cute, attractive, and very usuable. It is perfect for one person enjoying an afternoon of tea, and would be large enough to include a guest when appropriate. I have used it twice and have found its design easy to manuever. Perfect teapot for one serving. I wanted something small and durable for college and this is great! 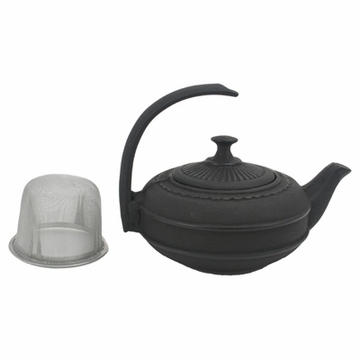 Great little teapot, perfect size for one or two people to enjoy. I was not sure of the reports I had heard and read about the quality of tea from a cast iron pot...I am now happy to say that the statements of cast iron pots brewing the best cup of tea you can enjoy is absolutely true. i got this for my daughter for Christmas. she wanted a teapot to brew a little tea. its so tiny and perfect and i love the handle! Kitchen counter jewelry!!! The most beautiful teapot I've ever seen. Holds just enough special tea for myself and close friend. I really do love this teapot.